The Jews had sought to seize Jesus to put Him on trial for blasphemy, but Jesus departed from them and went to Bethany beyond the Jordan, about 50 miles northeast of Jerusalem, where John the Baptist had first been baptizing people. As we pick up the narrative again in Luke 13:22, Jesus has moved back north probably into the region of Galilee since it is an area controlled by Herod Antipas who is mentioned in verse 3,1 and Luke 17:11 specifically places Jesus as passing between Samaria and Galilee on His way to Jerusalem. Notice in verse 22 that Luke specifically points out that Jesus is making His way to Jerusalem and that He is teaching in the cities and villages as He passes through them. Jesus must be in Jerusalem by Passover in order to fulfill the prophecies concerning Him. However, He is not in a rush to get there any earlier than that. He is taking His time to teach in the population centers and those He encounters along the way as He heads south. It is in such a setting that someone asks Him a question as recorded in verse 23. 23 And someone said to Him, “Lord, are there just a few who are being saved?” There is more to this question than just curiosity. Underlying it is the quest to understand the nature and extent of Jesus’ ministry in both its political and theological aspects. In the political aspect, there was a common expectation that Messiah would come to conquer and reestablish the nation of Israel to the glory, prestige and power it had under King David. They thought in terms of the many prophecies about a renewed Israel and did not understand the placement of prophecies such as Isaiah 53 in which Messiah would be a suffering servant. It is now the third year of Jesus’ ministry, and though at times there would be large crowds that would turn out to hear Him teach and would gather to be healed by Him, there was not any political movement to make Him king. In fact, according to John 6:15, when such an effort did arise, Jesus withdrew from them. One aspect of this question then was to understand the nature of the kingdom He was going to establish. The political and theological expectations ran together with the belief that national salvation would accompany national restoration. If Jesus was not restoring Israel as a nation, then was His plan to only save a few? The theological aspect is probably more in view here especially in the context in which Luke sets it. Luke 12 and the first part of chapter 13 record a lot of conflict between Jesus and the religious leaders and many warnings by Jesus to everyone about being ready for the coming of the Son of Man who would reward the righteous and judge the unrighteous. This was contrary to the common idea that Jewish people would be saved because they were descendants of Abraham. The extent of that salvation was debated since it was not believed that the most wicked people would be saved. The question then became how righteous you needed to be to be assured of salvation and the degree of wickedness that would keep you from salvation. The teachings of Jesus were confusing to them. On the one hand, the parables of the Mustard Seed and Leaven (Luke 13:18-21) made it appear that many would be saved. On the other hand, the warnings for common people to repent who were not doing anything that appeared outwardly evil (Luke 13:1-5) made it appear that few would be saved. Of course underlying either of these aspects of the question is the idea of salvation. Salvation from what? That is still a problem in our own time. The same word can be used and have very different meanings. The particular word here is swvzw / s dz which has a general meaning of “to deliver from a direct threat,” and “to make safe and sound out of a difficult situation” (TDNT). Context determines the threat or difficult situation. Salvation from an enemy would be deliverance from their threat. Salvation from a storm would be deliverance from injury and death or be safe and sound in the midst of it. Ideas of theological salvation varied, but it commonly was understood then as deliverance from God’s judgment both temporal and eternal and being made safe and sound within God’s kingdom. Regardless of what the man intended by his particular question, Jesus’ answer is directed to all the people present and concerns being made safe and sound for eternity within God’s kingdom. His emphasis is upon doing everything you can to be sure that you are saved and will not be shut out of God’s kingdom. Jesus answers the question of few or many only indirectly. There are many Scriptures that emphasize God’s sovereignty in salvation. For example, Jesus said in John 6:44, 65, 44“No one can come to Me unless the Father who sent Me draws him; and I will raise him up on the last day . . .” 65 And He was saying, “For this reason I have said to you, that no one can come to Me unless it has been granted him from the Father.” Why? Psalm 14:1-3 which is repeated in Romans 3:10-12 explains, “. . . 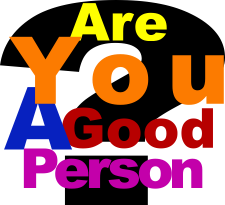 There is no one who does good. 2 The Lord has looked down from heaven upon the sons of men To see if there are any who understand, Who seek after God. 3 They have all turned aside, together they have become corrupt; There is no one who does good, not even one.” The apostle John declared in John 1:12-13, “12 But as many as received Him, to them He gave the right to become children of God, even to those who believe in His name, 13 who were born, not of blood nor of the will of the flesh nor of the will of man, but of God.” You cannot be born again because of genealogical lineage, your desire or the desire of other people. It comes only by the will of God. The apostle Paul put it bluntly in Ephesians 1:4, “just as He chose us in Him before the foundation of the world, that we would be holy and blameless before Him.” God’s election occurred before you were born. Whether you like this fact or not, God is sovereign, and without the extension of His love poured out in His mercy to allow you to still be alive, and His grace in sending Jesus to pay the redemption price, and the ministry of the Holy Spirit to convict you of sin, righteousness and judgment and then regenerate you so that you can believe, you could not be saved from sin and its consequences. God’s sovereignty in salvation is absolutely humbling to man, but that is precisely why so many people reject it. It interferes with their pride. But it is to the humble that the Lord extends His grace while He resists the proud. At the same time, there are many passages that emphasize man’s responsibility in salvation. This is one of those passages. Jesus states this in the command voice. It is not an option. You must strive to enter through the narrow door. What door? The context is clear that this is the door into to the kingdom of God, the door of eternal salvation, this door is narrow. This is similar to what Jesus said in Matthew 7:13-14, 13 “Enter through the narrow gate; for the gate is wide and the way is broad that leads to destruction, and there are many who enter through it. 14 “For the gate is small and the way is narrow that leads to life, and there are few who find it.” Contrary to popular belief, there are not many roads to heaven and there are not many ways to God. There is one and one only. Jesus said “I am the way, and the truth, and the life; no one comes to the Father but through Me” (John 14:6). The apostle Peter boldly proclaimed Jesus Christ to the Sanhedrin that had arrested him and then concluded, “there is salvation in no one else; for there is no other name under heaven that has been given among men by which we must be saved” (Acts 4:12). The striving describes the diligence, passionate struggle and constantly renewed mental concentration needed to repent and believe. Hebrews 11:6 describes its humble beginning, “And without faith it is impossible to please Him, for he who comes to God must believe that He is and that He is a rewarder of those who seek Him.” That may seem obvious to many since everything around us shouts that there is a God that created us, but we live in a time when the obvious is denied and our public schools, government institutions, and most media companies teach that contrary to the laws of physics, matter magically appeared and then organized itself into even life by time and chance. Even those who acknowledge that an intelligent being had to create them are resistant to the fact that they themselves are but a created creature. It takes humility to accept and rejoice that your value comes from your Creator and not yourself, and that your purpose in existence is defined by the Creator and not your own desires. The striving continues in the diligence and passion of seeking God as described in Deuteronomy 4:29 and Jeremiah 29:13, “you will seek Me and find Me when you search for Me with all your heart.” Remember that “heart” when used metaphorically in the Scriptures refers to the mind and will that make up the core of your being and not just emotions which arise out of it. The Lord is near to the brokenhearted and those who call upon Him in truth (Psalm 34:18; 145:18), but those who seek God casually or as it is convenient to them will miss Him because self interest instead of truth directs their lives. Such people do not exert themselves to enter the narrow door because their interest is too low and they do not recognize the need. This striving also requires mental concentration to accept the Lord’s invitation in Isaiah 1:18, “Come now, and let us reason together,” Says the Lord, “Though your sins are as scarlet, They will be as white as snow; Though they are red like crimson, They will be like wool.” The gospel is simple, but it can be hard to grasp mentally because it is contrary to man’s nature and desires. Paul comments in 1 Corinthians 1:18-31 that though the Greeks search for wisdom, the world through its wisdom does not come to know God for the word of the cross is foolishness to those who are perishing. Paul was often found reasoning with both Jews and Greeks but the vast majority rejected his message. Only those that responded to “the foolishness of the message preached” believed and were saved. The Athenian philosophers were attentive to the very well reasoned arguments of Paul until he got to Jesus death and resurrection at which point they began to sneer at him (Acts 17:22-33). You must strive in order to get past personal bias, erroneous presuppositions and group-think in order to understand and believe the gospel. Only a few of them did then (Acts 17:34), and relatively few do so now. The Lord’s thoughts and ways are not like yours (Isaiah 55:8-9), and it is very difficult for finite humans to mentally grasp the declarations of an infinite being they cannot fully comprehend. Striving to enter the narrow door must be a priority that is not delayed for as Isaiah 55:6-7 both warns and prompts, 6 “Seek the Lord while He may be found; Call upon Him while He is near. 7 Let the wicked forsake his way And the unrighteous man his thoughts; And let him return to the Lord, And He will have compassion on him, And to our God, For He will abundantly pardon.” It is a wonderful offer, but it is only available for a limited time to each individual. Jesus expands on this warning. The imagery here could refer to several different situations such as a man closing his door for the evening to go to bed as described in Luke 11:5-8 or the closing of the door at a wedding feast as described in Matthew 25:1-13. The point is that you need to enter through the door before it is shut and it is too late. They will cry out for the door to be opened, but it will remain shut. Obviously the door of opportunity for salvation is shut on the individual when they die. Hebrews 9:27 warns, “it is appointed for men to die once and after this comes judgment.” This warning is magnified by the fact that death often comes suddenly when not expected. This door of opportunity will be closed for all when the Lord returns in judgment at the end of the tribulation period, the seventieth week of Daniel 9:27. We know from Matthew 25:31-46 that at that time the righteous and wicked will be separated and judged accordingly in the sheep and goat judgment. This warning is also made more serious by the fact that the narrow door into God’s kingdom could be closed for the individual before either death or the Lord’s return if the Holy Spirit ceases His work in them to bring them to a conviction of sin, righteousness and judgment. The Lord is patient and longsuffering, but at some point that ends. Remember that Pharaoh hardened his own heart five times before the Lord confirmed his rebellion and hardened it (Exodus 7:13, 22; 8:15, 32; 9:7, 12). That hardening does not have to take the form of outright rebellion and antagonism toward God, for even Pharaoh confessed that he had sinned after the seventh and eighth plagues before changing his mind again. How tragic that these people wanted to get in, but it was too late. Those who continually put off repenting of their sins and placing their faith in the person and work of the Lord Jesus Christ for the forgiveness of sins are in grave danger of finding out they are too late and cannot be saved due to either death, the Lord’s return or the hardening of their own heart. These people had an acquaintance with Jesus. They had a meal in a place where He was present and they heard Him teach. What tragedy that they were so close and remained so distant and that they heard him with their own ears but did not heed what He said. They were not His sheep and He would not be their shepherd. Their argument to receive a special dispensation and have the door reopened for them is in reality quite ridiculous. Does anyone present actually think that hearing someone give a lecture and then eating a meal with him makes you anything more than an acquaintance? How does having been in physical proximity suddenly equal intimate friendship? I have preached many sermons in many places to many people and have eaten many meals with many different people, but that does not mean that I will be inviting them into my home to live with me. In fact, having met them and knowing they ignored what I taught, I would be adamant that they would not be coming into my home to live with me. That is Jesus’ response here. He has given plenty of warning and they even admit that they have heard Him teach, but they ignored it, and now it is too late. The greater tragedy is that this will apply to many people that regularly attend church. What applies to the false teachers in Matthew 7:21-23 will apply to their followers. They may properly acknowledge that He is Lord, but they have not followed Him. They may even do things in His name, but they do not obey Him. They are told to depart. Jesus describes what their reactions will be in verse 28. 28 “In that place there will be weeping and gnashing of teeth when you see Abraham and Isaac and Jacob and all the prophets in the kingdom of God, but yourselves being thrown out. The weeping refers to grief and sorrow while the gnashing of teeth refers to rage. These describe both the reactions of different people and the mix of emotions that can occur in the same person. Both rage and sorrow arise out of their selfishness. The sorrow is that of remorse over recognizing what could have been but is not because they did not strive to enter through the narrow door. This will be most acute among the religious people that erroneously thought they were going to heaven. There will also be sorrow over not getting what they wanted and the suffering that come as part of the consequences of their sin. The rage will be the expression of anger over not getting what they wanted and hatred for those they blame for what they are experiencing. They will especially hate God even as those in Revelation 9 and 16 are described who blaspheme God because of the plagues upon them instead of repenting. The rage and sorrow will be amplified especially among the Jews by the fact that they will be aware that the patriarchs and prophets will be in the kingdom and they have been cast out. Apparently Hell will be similar to Hades described in Luke 16:22-26 in which those in torment are aware of those who are in God’s kingdom. That only adds to their torment as a constant reminder of what they could have had but rejected due to their own sin and self-righteousness. The reference to people coming from the four points of the compass to be part of God’s kingdom is to the Gentiles from around the world that are included. Such hope for the Gentiles was included in the third aspect of God’s covenant with Abraham that in him all the families of earth would be blessed (Genesis 12:3c) and repeated throughout the Hebrew scriptures by multiple prophets, but many Jews still thought of salvation as only belonging to themselves. This was a rebuke and warning to them. Gentiles would be included in having fellowship with God. Usually the phrase “the first shall be last and the last shall be first” (Matthew 20:16) refers to equality of outcome. It does that here as well, but it is slightly modified and within this context refers to some Gentiles, who received the gospel last, being included in the kingdom, and only some of the Jews, who received the gospel first, being included. That would be a surprise and an irritant to the ethno-centric Jews who reserved salvation for themselves. The answer to the man’s question was given indirectly. Many will seek to enter the kingdom and find it will be too late. Only some Gentiles and some Jews will be in the kingdom to enjoy the feast and fellowship there. Only a relative few will be saved, though that will still be a great multitude from every nation, tribe, people and language that cannot be humanly counted (Revelation 7:9). Be sure that you are one of those that is saved. Strive to enter through the narrow door. If you do not know if you would go to heaven, today is the day to repent and place your faith in the Lord Jesus Christ. Tomorrow could be too late. If you believe you are saved, examine yourself to be sure you are believing the truth about Jesus and that you are trusting Him and His work of atonement alone (2 Corinthians 13:5). You do not want to be surprised on judgment day. Finally, take this warning to heart as you witness to people. There is an urgency in the message of the gospel. Only God knows how much time an individual has to repent and believe before it is too late. There must also be care taken to proclaim the true gospel and not some perversion of it that would lead a person to falsely think they are saved. Assurance of salvation is a job for the Holy Spirit. Proclaim the whole truth and let Him work. If Jesus was not restoring the nation to bring about ___________salvation, was His plan to only save a few? Would the _______________ be expansive (Luke 13:18-21) or greatly limited (Luke 13:1-5)? Many Scriptures emphasize God’s __________in salvation: John 1:12-13; 6:44,65; Ps. 14:1-3; Eph. 1:4, etc. Questions to consider in discussing the sermon with others. Why had Jesus been in Jerusalem in John 9-10? What happened while He was there? Where is Jesus in Luke 13:22-30? Where is Jesus going and what is He doing along the way? What possible reasons are there that someone would ask Jesus, “Lord, are there just a few who are being saved?” What did the people expect would happen politically with the coming of the Messiah? What kind of theological salvation did the people expect with the coming of Messiah? What is the meaning of the word “saved” (swvzw / s dz )? How does context determine the meaning of this word? What Scripture passages make it clear that salvation is by God’s sovereign election of sinners? Why do people resist / reject the plain meaning of those passages? Luke 13:22-30 is a passage that clearly teaches that God will hold man solely responsible for rejecting the offer of salvation. What other passages clearly teach this same truth? Can man earn his salvation by good works of any type? Explain. What does the word “strive” (ajgwnivzomai / agonizomai) mean? How does a person “strive to enter through the narrow door” in relationship to the following: Hebrews 11:6? Seeking God? Understanding and believing the gospel? Self-denial? As a priority in life? How do each of the following close the door of opportunity to enter God’s kingdom: death; the coming of the Lord; the ceasing of the Holy Spirit’s ministry to convict? Why was physical proximity to Jesus not enough to enter His kingdom? Why is knowing about Jesus not enough to be saved? What must you do to be saved? Are there many or few that are being saved in current times? Explain. What would cause those shut out from God’s kingdom to weep? What would cause them to gnash their teeth? Can those in Hell see those in Heaven? Explain. What hope does Jesus give to the Gentiles in Luke 13:29-30? Why would that irritate the Jews? Are you sure of your salvation?